From amateur to professional, insane amounts of time and effort are spent trying to achieve smooth and steady video footage. DJI’s new Osmo handheld gimbal and 4K camera is meant to be the easiest and quickest path to gorgeous, silky-smooth shots. The Osmo, first teased at CES, resembles a cyclops eye mounted above a joystick. 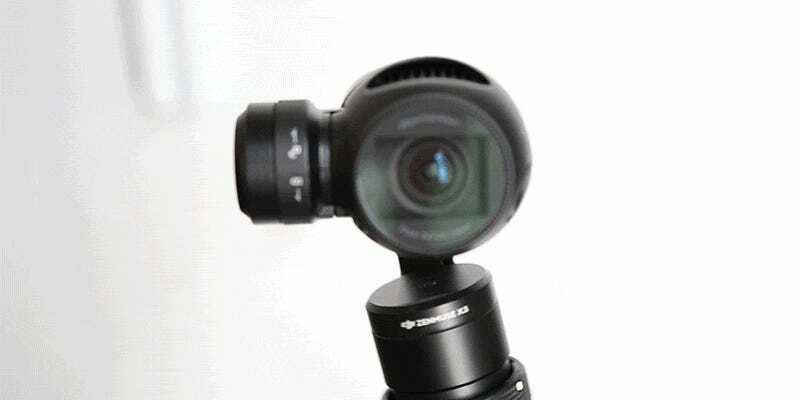 The spherical camera on top is the same as that found in the Inspire 1 drone system. With a 90 degree field of view and f/2.8 aperture, it shoots pretty nice 4K video as well as 12 megapixel photos. It’s outfitted with a 3-axis stabilized gimbal, which is powered by brushless motors to automatically compensate for your trembly arms. It really does create a floaty steadicam quality without bulky equipment. The gimbal not only allows steady video, but also has modes for shooting timelapses and automated panoramas. Stabilizers like this aren’t new. They have been used on similar handheld devices and drones for at least a couple of years now. But it’s still a relatively young technology, and devices that do what the Osmo does have been unrefined at best. Many of the stabilizers we’ve seen have not worked well or required tricky setups. This is a chance for DJI to offer a complete and user-friendly package. After being shown how to unlock the Osmo’s three swiveling arm mechanisms, I was able to intuitively use it with almost no further instruction. 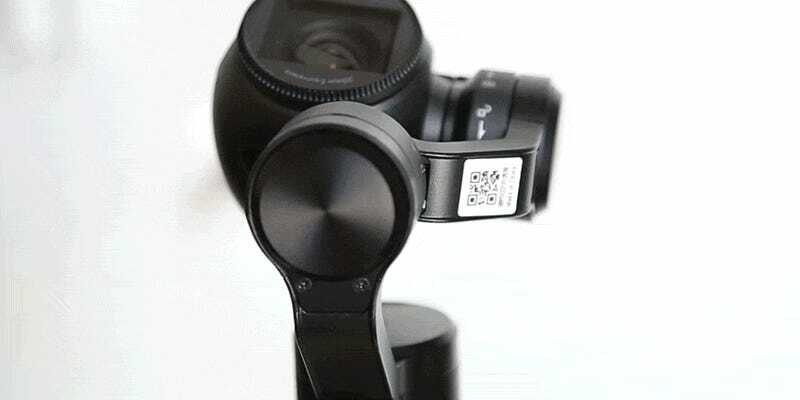 The camera will automatically sway momentum to face the way you are turning, and if you want to control it more precisely, there is a thumb-pad for pans and tilts. But perhaps the coolest, most useful feature is the front trigger. With a simple double-tap of the button, the Osmo resets itself to a fully front-facing and upright position. Triple-tap and the camera swings around into selfie-mode. This is going to be perfect for video bloggers who want an easy way to walk and talk without using an awkward selfie-stick. The internal mic records positively awful audio, but there is a mic input for attaching a better one. You’ll notice right away that there’s no display on the Osmo. That’s because you’re meant to mount your smartphone right onto the joystick. Fire up the DJI app for Android or iOS and connect to the camera’s wifi for monitoring your shot and controlling all the camera’s settings. It worked pretty seamlessly for me, though if you’re recording in 4K mode the playback and monitoring is pretty choppy in the app. You can switch between auto and manual settings, select a focus point, and even control the camera by dragging your finger around the screen. The biggest limitation I experienced in my time with the Osmo was battery life. The lithium-ion unit that sits in the handle lasts only about about an hour, so don’t plan on any all-day shoots without some spares stowed away. Osmos will run you $650 when it drops later this month. It’s expensive, yes, but kind of understandable when you consider that it includes a pretty advanced compact video camera plus the stabilizer. If you already own an Inspire 1 with an X3 camera (or new X5 Pro and Raw), you can buy the Osmo handle separately and mount the camera right on. There’s no price yet on the handle by itself. We’ve only had a couple of days with the Osmo and it’s a lot of fun. But check back for a more detailed review in the coming weeks.